Katja is passionate about science communication and education and has worked many years as research scientist in the field of atmospheric science and climate change. She has a talent to explain complex issues in simple ways engaging her audiences, no matter if she speaks to school children, university students or interested grown-ups. The topics she covers range from climate change, ice cores, ozone research and weather to Antarctica. She lectures at several universities and gives also presentations to community groups and school classes. Additionally to scientific papers Katja has also published popular articles in magazines like NZ Science Teacher, Chemistry Education in New Zealand and Water and Atmosphere . She participated in the Science Learning Hub and chapters in Te Ara and Climatica. 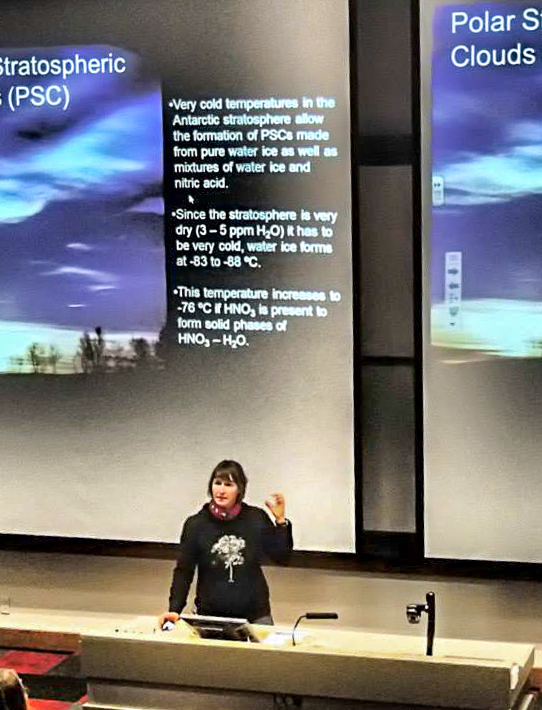 For the the movie Thin ice – The inside story of climate science she was interviewed in regard to her work monitoring greenhouse gas concentrations in New Zealand. See a part of the movie on Carbon dioxide measurements at Baring Head below. Hinrich Schaefer and Katja Riedel discuss their ice coring work on Taylor Glacier in Antarctica. PhD Student Eleanor Rainsley talks about her experience living and working on Taylor Glacier, Antarctica.